The Dew Moto Extreme event struck Islamabad this weekend on 27th October and left us buzzing with heart-pumping action! The arena came to life when Feroze Khan opened the show on his own decked up bike. He led an action-packed procession of 20 heavy bikers around the stadium and the audience went wild! Four expert Dew athletes performed unbelievable stunts through the night! There was Dallan Goodman, Fredrick Frog Bergren and Nick De Witt on FMX bikes. Is your heart thumping just by watching this? The audience was left in awe as they flew over the arena and pulled off mid-air somersaults, leaps and jumps! Didi Bizzarro; the Italian rider rode into the arena on his Superbike and left burning tracks in the concrete! Our favorite EDM experts ‘Somewhat Super’ performed at the event and played some sick beats all night! They got the audience pumped up and the sight of the crowd raising their fists to the sky and dancing along the music was spectacular. There was also an epic, highly anticipated appearance by the band Josh! They took center stage and amped up the night with their heart-thumping music! We haven’t stopped rocking out to their beats since! All our famous stars were there to make the event even more exciting and add a touch of glamour! 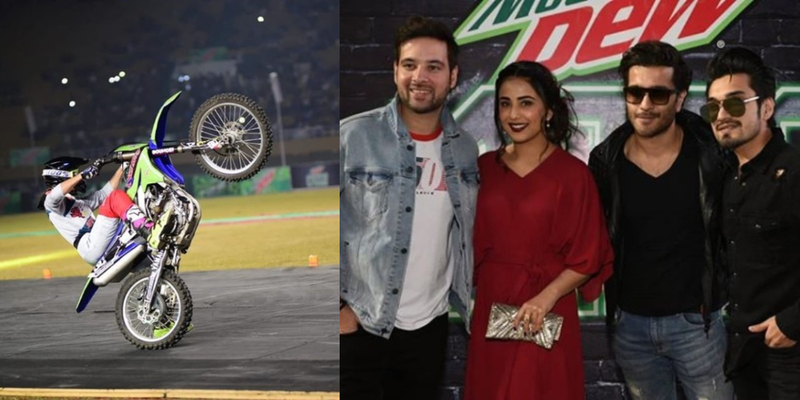 Celebrities and biking fans like Uzair Jaswal, Ushna Shah, Mikaal Zulfiqar were amongst the ones spotted at the event. Dressed in a beautiful red gown, Ushna looked absolutely flawless! Uzair Jaswal is sure giving us biker boy vibes! Mountain Dew really pulled off an EXTREME action rampage trio! And we can’t wait to see what Dew will do next.